Maria Thayer at the RAGE Official Launch party in California. 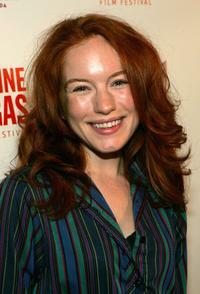 Maria Thayer at the Cinevegas opening night film "Strangers With Candy." Dennis Hopper, Maria Thayer and Elisabeth Harnois at the Cinevegas opening night film "Strangers With Candy." Maria Thayer at the opening night party for the CineVegas Film Festival. Maria Thayer at the premiere of "Strangers With Candy." Elisabeth Harnois, Greg Hollimon and Maria Thayer at the Filmmakers Luncheon during the CineVegas Film Festival.